NEW SGC-100 SOFT GEL ENCAPSULATION SYSTEM. Soft Capsule Machine Output: 10000pcs/h for 500mg, olive shape. 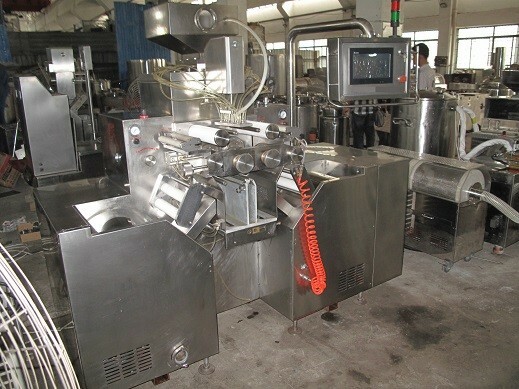 Includes: Colloid mill, Rotating Cages (for pre-drying), Air cooling machine, Heat preservation Kettle of Liquid gelatin, Electric control cabinet, Set of Moulds,(customer to specify) Micro lubrication system, Gelatin Melting System, Portable Gelatin melting kettle, Water Recycle Vacuum Pump, Drying System, Stainless steel drying Truck, PVC plate, Checking table. Delivery Time: Approx 8-10 weeks from receipt of 65% Deposit.